I’m wondering if those of us engaged in slow work, should introduce a version of the building trade’s ‘topping-out’ ceremony to mark important milestones along the way. 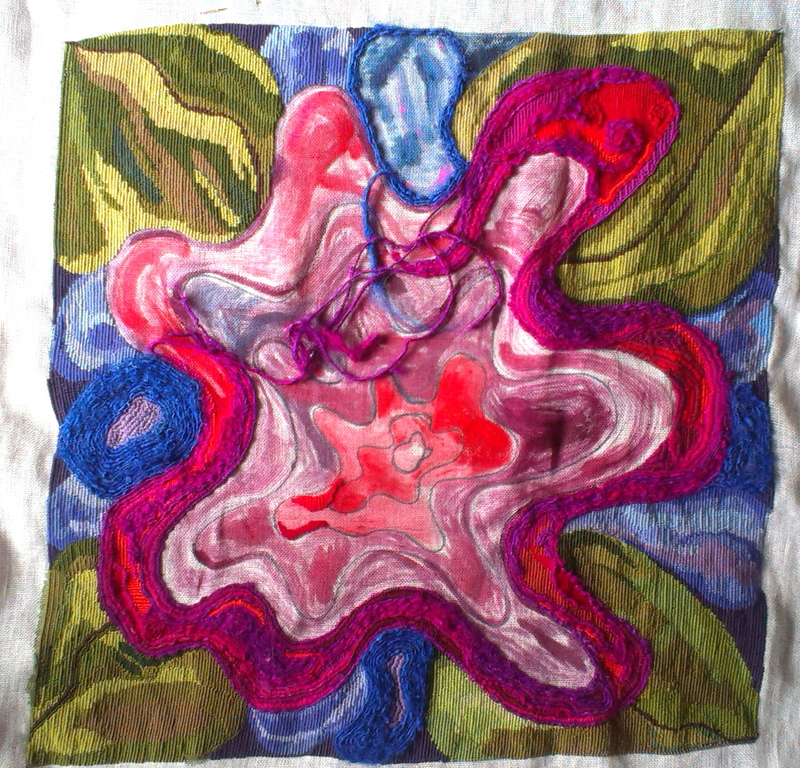 This weekend, I finally completed the four corners of the splodge/spring flower. So today I’m having a little cornering ceremony. Champagne is in short supply (and anyway it goes straight to my head, which would wipe out the rest of the day), so instead I’ll have a pot of coffee and a slice of lemon drizzle cake. Now that I look at it off the frame for a few minutes, I don’t think it’s very flower like – more like what happens if you drop a tin of reddy/purple paint onto a piece of canvas from a moderate height. But then that title doesn’t exactly trip off the tongue. Oh well, never mind. The good thing, is that it is now beginning to have some weight. One aspect of this type of needlepoint that I love, is the way that as it is stitched, the texture of the whole cloth changes, moving from a flexible, thin loose-weave fabric, to a thick, soft and tightly bonded cloth. Right, celebrations over, time to put it back on the frame and get into the middle. It looks amazing and I do like the idea of bit of celebrating every now and again. Tea and lemon drizzle sounds good, I hope you enjoyed them both. You certainly deserved it after all the stitching you have done. The great thing about your piece is that the viewer can see so much in the work and indulge in a little imaginative exploration of their own. Well done. Oh Alister, thank you so much, that’s lovely. Thank you – I’m having fun mixing things up a bit. It is difficult I agree – we need to think up some suitable ways to mark our progress! I love the way those colours are swirling around, and the changes in texture depending on your stitch size and the type of stitch you’re using. It has a wonderful sense of bursting energy and vibrant life. Very welcome as spring seems to be in stop start mode just now! Stop start is an excellent way of putting it – I agree. You know all those swirls are your doing – if you hadn’t tickled the couching gene, I’d never have tried it out. Thank you. It looks fabulous, Anny. I think it is coming together really well. Thank you – sorry for tardy comment – combination of migraine and weekend. Such lovely strong colours and a great modern take on the art of needlepoint! Thank you. After this winter, I think we all crave some rich colours!